The 2019 Rugby World Cup is the ninth global rugby tournament, and first on the Asian continent. Across six weeks, running from September 20, 2019, until November 2, 2019, the sporting world will be fixed on the Land of the Rising Sun as 20 nations compete for the famous Webb Ellis Cup. Up to 400,000 international visitors are expected to descend on the country, staying for an average of 14 nights during the tournament. What can traveling and expat fans alike expect when the tournament begins? Here we highlight Japan’s rugby heritage, the best places to watch the matches and what to expect on match days as World Cup fever grips the nation. The game of rugby union is believed to have originated in England in 1823, when a Rugby School student called William Webb Ellis picked up a football during a match and ran with it in his arms. Fast forwards to 1987 and the first Rugby World Cup—the trophy of which is named after the game's founder—is hosted in New Zealand and Australia, with the New Zealand All Blacks taking the crown. The World Cup is contested every four years, and only four nations have ever won it: New Zealand (the current champions) has won three times, Australia and South Africa have won twice each, and England has won once. The All Blacks and Ireland are the current favorites to win in 2019, but 12 months is a long time in the world of international rugby. Next year’s World Cup will be the first played outside the traditional rugby heartland, Europe and parts of the southern hemisphere. One reason why Japan hosting the World Cup is so significant is the chance for a nation that typically isn't associated with rugby to compete on an even footing with the big names and players in the rugby world. Before Japan famously beat South Africa at the last World Cup in 2015, the previous high for the Brave Blossoms—as the Japanese rugby team is known—was beating Samoa to win the Pacific Nations Cup in 1999. In the past, no top tier nation ever gave them a game. Japan traces its rugby heritage back to the middle of the 19th century, when the city of Yokohama opened its port to western ships. In 1854, the Convention of Kanagawa effectively ended Japan's policy of national isolation, and opened Japan to the rest of the world. With it came the first beer brewed in the country, the first daily newspaper, the first railway and the first rugby football club. Yokohama Football Club was established in 1866, making it the oldest rugby club in Asia, and among the oldest in the world. Two years later the club was consolidated into the Yokohama Country and Athletic Club (YC&AC), who celebrate their 150th anniversary in 2018. Rugby peaked in popularity in Japan in the late 1970s, '80s and early '90s, with the success of clubs such as Nippon Steel and Kobe Steel making household names of their players. But national efforts to win the bid to host the FIFA World Cup in 2002 meant that soccer took over, especially with younger generations. Twelve cities spanning from Sapporo, on Japan's northernmost island Hokkaido, to Kumamoto, in the south of the island of Kyushu, have been selected to host the 48 matches of the tournament. The action kicks off in Tokyo’s Ajinomoto Stadium between Japan and Russia and culminates with the final in the 72,327 capacity International Stadium Yokohama of Kanagawa Prefecture. 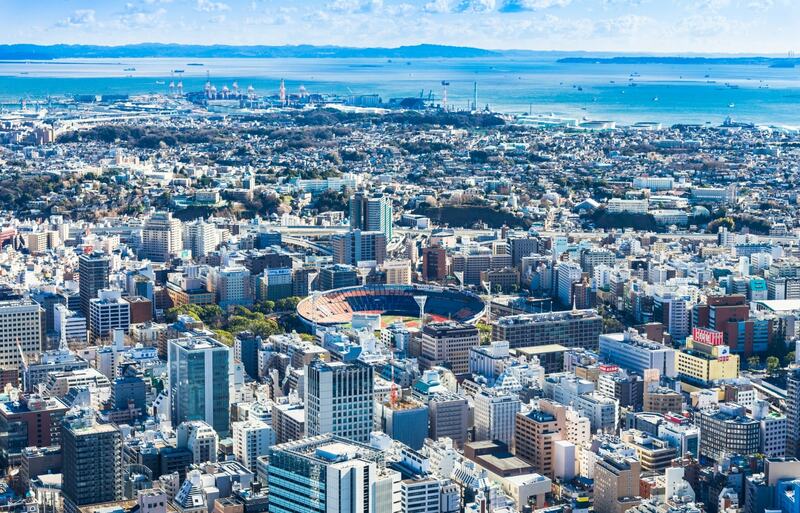 Japan’s rich history, exotic cuisine and dramatic geography will provide something for every visiting fan to enjoy, regardless of the performance of their hometeam. But where to start? No trip to Japan would be complete without a visit to the capital, the most populated city in the world with over 38 million inhabitants. Home to the Sunwolves Super Rugby team, you can expect to mix it up with some of the most passionate rugby fans, whether sinking fine sake in Shinjuku, dining out on mind- blowing sushi in Ginza or tearing up the karaoke mic in Roppongi. Yokohama is another must-visit landmark. Once you’ve mixed it with kindred spirits in the YC&AC Members Bar, be sure to check out nearby Sports Bar Shiba, boasting a long menu of international craft beers and big 4K projectors to catch the action. Then follow your nose to the intoxicating street food stalls of Japan’s largest Chinatown (chukagai) for nikuman meat buns and refreshing coconut water. Further south on Japan’s southern main island of Kyushu lies Oita, a land of mountains and jaw-dropping beauty. Soak up the sun, surf and thermal springs in one of the region’s many onsen baths—providing much needed relaxation if your team makes it to one of the quarter final matches hosted in this southern city. By contrast, Sapporo on the cooler northern island of Hokkaido, will provide traveling fans with the chance to witness the famous momijigari (autumn foliage), when leaves turn a dramatic shade of red, amber and yellow. If the language barrier and exotic cuisine proves a bit of a culture shock, the match day experience inside the stadiums should feel a bit more like home. But there will be a few twists that take some getting used to. “For starters it’ll likely be typhoon season when the World Cup kicks off so prepare for the occasional wet and wild night,” says Freeman. If not pies, two things you should be able to rely on, however, are cleanliness and train punctuality. Japanese football fans made headlines at the 2018 FIFA World Cup in Russia by simply picking up their litter after matches—even when they were knocked out by Belgium. Plus, the lightning fast Japanese bullet trains (shinkansen)— which can reach speeds of 320km/h (199mph), 30% faster than trains in Britain—are the envy of the world. They run the length and breadth of much of the country, meaning no ambitious itinerary is ever out of the question. Now you know Japan’s rugby heritage and where to hunt down your fellow egg-chaser brethren once the World Cup kicks off! So it’s time to plan your route, book your flights and brush up on your nihongo (Japanese). Excited? You bet. It’s so close, you can almost taste it—sushi, sake, shochu and more. Sam Rider is a sports, fitness and travel writer, based in London. He's written for The Telegraph, The Guardian, National Geographic, ESPN, Men's Health, Men's Fitness, Rugby World and Gentleman's Journal, among others. Passionate about rugby union despite the injuries it's caused to his body, he mostly covers the sport to indulge a deep obsession with the game. Find him tweeting at @samrideruk and on Instagram @samrideruk.